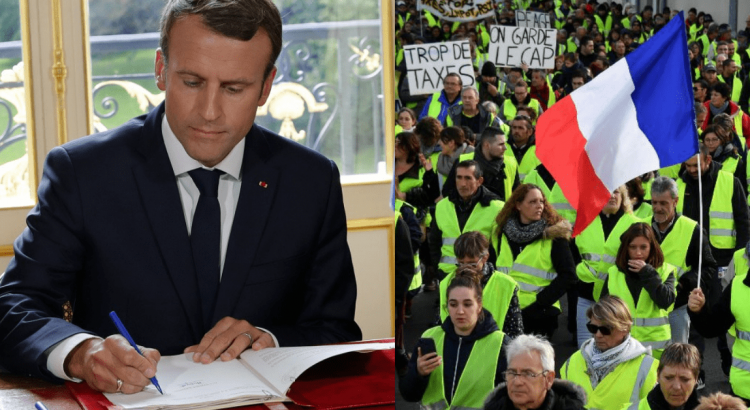 Following weeks of protests by the ‘Gilets Jaunes’ movement, the French government has launched a ‘Great Debate’ meant to deliver solutions to the country’s most pressing problems. To kick off the debate, President Emmanuel Macron wrote an open letter to the French today. This is an interesting text to study (irrespective of your political opinions on the matter), so we’ve put the original letter and its Euronews translation side by side below, with a handy audio button. 👉 For more French resources, browse our French news, culture and entertainment videos for language learners. Le premier sujet porte sur nos impôts, nos dépenses et l’action publique. L’impôt est au cœur de notre solidarité nationale. C’est lui qui finance nos services publics. Il vient rémunérer les professeurs, pompiers, policiers, militaires, magistrats, infirmières et tous les fonctionnaires qui œuvrent à votre service. Il permet de verser aux plus fragiles des prestations sociales mais aussi de financer certains grands projets d’avenir, notre recherche, notre culture, ou d’entretenir nos infrastructures. C’est aussi l’impôt qui permet de régler les intérêts de la dette très importante que notre pays a contractée au fil du temps. Notre modèle social est aussi mis en cause. Certains le jugent insuffisant, d’autres trop cher en raison des cotisations qu’ils paient. L’efficacité de la formation comme des services de l’emploi est souvent critiquée. Le gouvernement a commencé à y répondre, après de larges concertations, à travers une stratégie pour notre santé, pour lutter contre la pauvreté, et pour lutter contre le chômage. In our country, those who work pay for retirees’ pensions. In our country, a large number of citizens pay an income tax, sometimes burdensome, which reduces inequalities. In our country, education, health, security, justice are accessible to all regardless of their circumstances or wealth. The hazards of life, such as unemployment, can be overcome, thanks to this effort shared by all. I share this impatience. The society we want is a society in which to succeed one doesn’t need relationships or fortune, but effort and work. In France, but also in Europe and in the world, not only a great sense of unease, but also a great concern have taken over people’s hearts. We must respond with clear ideas. In recent weeks, many mayors have opened their town halls so that you can express your wills. I have had much feedback to consider. We are now entering a larger phase and you will be able to participate in debates near your home or express yourself on the internet to put forward your proposals and your ideas – in France, overseas territories and among French residents abroad. In villages, towns, neighbourhoods, on the initiative of mayors, elected officials, community leaders, or ordinary citizens … in parliamentary assemblies both regional and departmental. For me, there are no questions off limits. We will not agree on everything, that’s to be expected, it’s democracy. But at least we will show that we are a people who are not afraid to speak, to exchange viewpoints, to debate. I have not forgotten that I was elected with a project, of which I remain faithful to its foundations. I am resolute in thinking that we must restore France’s prosperity so that it can afford to be generous because one goes with the other. I am resolute in thinking that the fight against unemployment must be our top priority and that employment is created first and foremost in companies, so we must give them the means to prosper. I am resolute in thinking that we need to rebuild a school of trust, a renewed social system to better protect the French and reduce the inequalities at their causes. I am resolute in thinking that the depletion of natural resources and climate change force us to rethink our development model. We must invent a new productive, social, educational, environmental and European project that is fairer and more effective. On these major axes, my determination is unchanged. Making the ecological transformation can reduce households’ spending on fuel, heating, waste management and transportation. But to succeed in this transformation, we must invest heavily and support our less well-off citizens. How can we strengthen the principles of French secularism, in the relationship between the state and the religions of our country? How can we ensure everyone’s respect for the mutual understanding and intangible values of the Republic?